By now I expect that you will have heard of the Teaching Excellence Framework (TEF) and how it will impact the University. Previously Phil Brophy provided an excellent blog that summarises what TEF is and what it means for the university (Phil Brophy’s Blog), so I’ll not repeat anything here unnecessarily and I would highly recommend that you read it if you haven’t yet had chance. Before I go on, let me introduce myself – I am Melissa, the new TEF Programme Manager and I joined the University in April after spending 12 years lecturing, programme leading and leading academic teams across both the HE and FE sectors. From what I’ve seen so far, there is a really positive and professional approach here at Swansea and I am very much looking forward to contributing to it. So without further ado here is a brief update on progress with TEF and what you can expect to see in the coming months. 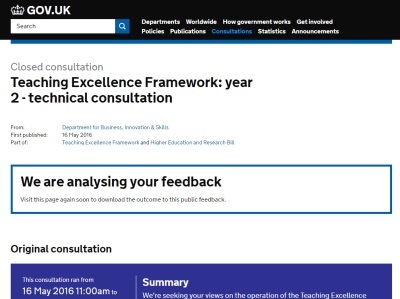 The TEF Year 2 (TEF 2 – 2017/18) Technical Consultation is complete and the Government is currently reviewing the responses with an aim to produce its findings and the complete guidelines at the end of September. As yet, the Higher Education Funding Council for Wales (HEFCW) have not confirmed whether Welsh Universities will be able to participate in TEF 2, but we are proceeding with the application on the basis that they will, as the results of the TEF will impact student recruitment, our league table positioning and therefore our reputation and financial sustainability. The core metrics for assessing TEF are based on the NSS results, non-continuation and DLHE, averaged over three years. The Times Higher Education ran a mock TEF in June 2016 and when benchmarked the results of this indicate that Swansea University is ranked 4th in the UK (Times Higher Education Mock TEF). Although the NSS results this year still indicate a good overall satisfaction, there has been a decrease associated with teaching and personal development. As a result, our performance next year will have to improve in order to maintain our TEF scores for the three year average. With so much uncertainty in the current climate, the one thing we have most control over is how we as a University engage with and support our students, so it goes without saying that we should listen to the feedback from the NSS, alongside other student voice and see what more can be done to improve the student experience. As part of the submission for TEF 2 the University must produce a supporting document that contextualises the metrics that have been used in the assessment process, whilst giving us the opportunity to supply any other information that further demonstrates excellent teaching at Swansea. The document is limited to 15 pages and must be submitted in January 2017, but I am pleased to say that a diverse team from across the University has been brought together and have already started the writing process. The core theme of the document is that of Value Adding – about an institution that takes in a broad range of students, supports them with research led teaching and helps them to achieve quality employment. There is clearly a great deal of excellent work that goes into supporting the students here at Swansea so the hardest part of writing the document will be limiting it to 15 pages. As well as preparing the submission for TEF 2, work has begun on developing the programme level assessments that will be used to support the application for year four of the TEF. A ‘mock’ TEF will be rolled out across the University in the coming months and consultation on the process and the content will begin in October 2016. The mock TEF will replace the Annual Programme Review (APR) for session 2016/17 and the results should help to inform our improvement plans. Martin Stringer will be attending College forums in the next couple of months to engage and consult with staff over TEF 2 and answer any questions that you might have. The team will continue to provide regular updates in the form of this blog and through other channels, such as a newsletter. If you would like any further information or to contribute to the 15 page submission, then please do not hesitate to contact me. ”If I build it, will he come?” Would they want to find out more on Pebble+?